"Our kind of town, Chicago"
Franck couldn’t have said it any better! A few months ago we submitted our visionary proposal to transform the Pershing Road buildings, and today we are very proud to have been shortlisted amongst the finalists of the C40 Reinventing Cities competition. We are heading what is an ambitious project with an equally-ambitious team, and although we can’t provide the full detail of what we have planned, we can guarantee the transformative impact this project will have on how we take on industrial reconversions and what role local communities can and should play in that process. 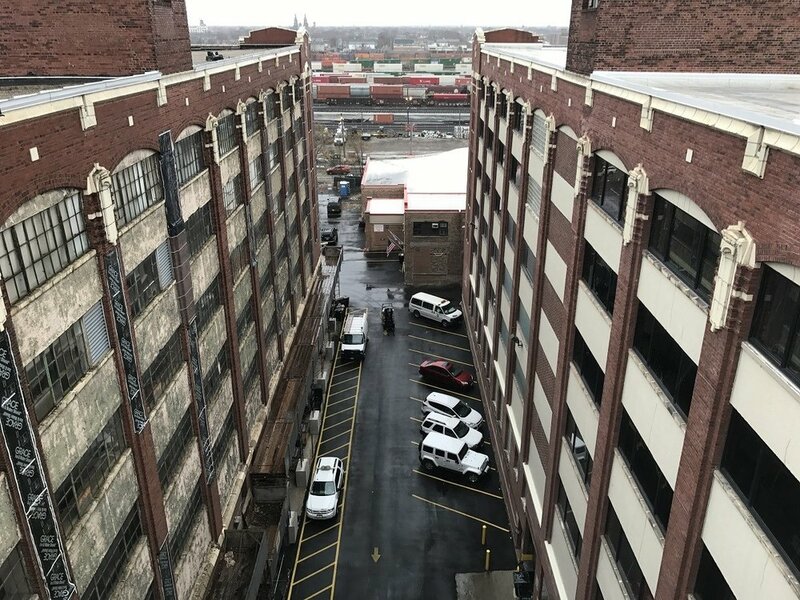 To help us shape the future of the Pershing Road Buildings, we'd like to hear from the people that know McKinley Park and the Back of the Yards best : you! So whether you live, work or play in the area, please fill in the form bellow with your ideas, suggestions and/or concerns. Understanding your specific needs and aspirations will help us best meet your expectations through our project. Hace algunos meses, entregamos nuestra propuesta visionaria para transformar los edificios de Pershing Road, y hoy estamos muy orgullosos de haber sido nominados como finalistas de la competición C40 Reinventing Cities. Lideramos un proyecto ambicioso con un equipo no menos ambicioso, y aunque aun no podemos desvelar el plan en todos sus detalles, garantizamos el impacto transformador que este proyecto tendrá en la forma de abordar las reconversiones industriales y el papel que las comunidades locales pueden y deben desempeñar en este proceso. Para ayudarnos diseñar el futuro de los edificios de Pershing Road, nos gustaría conocer las opiniones de las personas que conocen McKinley Park y Back of the Yards mejor que nadie: ¡ustedes! Por lo tanto, ya sea si vive, trabaja o juega por la zona, por favor rellene el formulario que encontrará más abajo con sus ideas, sugerencias y/o preocupaciones. Entender sus necesidades y aspiraciones concretas nos ayudará a colmar sus expectativas mediante nuestro proyecto. What is your relationship with the Pershing Road Site? Thank you for providing us with your ideas and concerns for the redevelopment of the Pershing Road Buildings! We believe that our project should first and foremost benefit the local communities that revolve around Pershing Road. In order to fulfil this commitment we'd like to offer you the opportunity of becoming part of the Team Pershing Community. As a member of the Team Pershing Community, you will receive exclusive updates on project advancement, be granted the chance to take part in the development process and benefit from discounts on future goods, experiences and services from our partners. All you have to do to participate is to send your name, home address, and a picture of yourself holding a sign with the words "TEAM PERSHING" on it to the following email address : simon@the-street-society.com.